If he didn’t hate Christmas so much he’d probably make the Starbucks worker write his name as “Merry Christmas” on the cup. 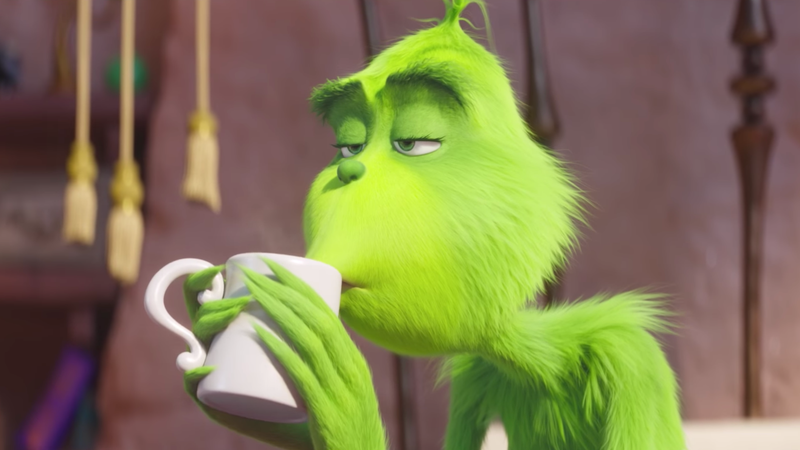 The first trailer is out for The Grinch, the latest Seuss-lite animated film that replaces meaningful life lessons with pop culture references and Tighty Whities. And this time around, it looks like the Grinch is less a public menace who seeks to destroy Christmas, and more a disgruntled humbug who’d take 11 items into the 10-item lane at the grocery store. I’m shaking in my fur pants. The Grinch stars Benedict Cumberbatch as the titular Grinch, who’s now a lazy old fogey who doesn’t like Mondays and spends his time making weekly grocery trips while slightly inconveniencing the other customers. No, seriously, that’s literally all he does in this trailer. Well, that and putting on a pair of fur pants over his undies that are the same color as his normal naked fur flesh. Why? Why does the Grinch need to wear fur pants? I’m pretty sure we don’t need to avert innocent eyes from the Grinch’s shame. Won’t somebody please think of the children? He’s naked without those fur pants! Anyway, this looks kind of stupid and I have no interest in seeing it. The Grinch comes out November 9. Have fun parents! This one’s all for you. I Asked For a Transformers Toy For Christmas. What I Got Instead Was Horrible.